APM Truss is proud to offer our very own high quality, professionally manufactured roof trusses. APM Truss is proud to offer our very own high quality, professionally manufactured roof trusses. With many affordably priced packages available our engineered wood trusses are offered to builders, contractors, and homeowners alike. By teaming with MiTek Corporation and utilizing their complete 20/20 program (the top-of-the-line software solution for building component manufacturers) we can assure total expertise in truss engineering. We are well qualified to offer complete design and engineering services, including sealed drawings for any state. Our facility is capable of manufacturing trusses up to 80' wide, which we also deliver. Our goal at APM Truss is simply to provide high quality trusses, as well as the most popular, name brand, nationally known, building products at affordable & competitive prices. The greatest savings can be acheived when you bundle some of the many different products that we have to offer; one stop shopping means a lot less headaches. These include the products that we manufacture on site, Trusses, Tuff-Posts (engineered wood pole building posts, with a unbeatable lifetime warranty), and T&G boards, as well as stocked lumber, steel roofing, shingles, siding, doors, window, insulation, trim and much more. MiTek's Engineering Services lead the industry in credibility, speed, accuracy and efficiency. With Professional Engineers licensed in all US states and Canadian provinces, MiTek has strategically located its engineering offices to provide expertise in reviewing the designs of component manufacturers across North America*. By utilizing the speed of the Internet and state of the art workflow and imaging technology, we have created instant linkage with our customers' engineering and design departments. In jurisdictions where permitted, customers of MiTek's engineering services may use the browser-based MiTek Link program, and have their truss designs reviewed and returned electronically via the Internet. We also offer these in a secure Adobe PDF format, allowing you to download sealed truss designs quickly and efficiently. Builders, building inspectors and designers across North America all benefit from the responsible and efficient review services of the industry leader. More and more contractors, project engineers, and municipalities are requiring submittal of Sealed Truss Placement Plans and Sealed Truss System Bracing Plans for their projects. We have created a separate Fee-Base Professional Engineering Service to fulfill that demand and eliminate the search for an outside source. Your sealed truss designs, sealed placement plans, and sealed bracing plans are delivered to you by mail or electronically in one package. Let APM Truss be your provider for sealed placement and truss system bracing plans! 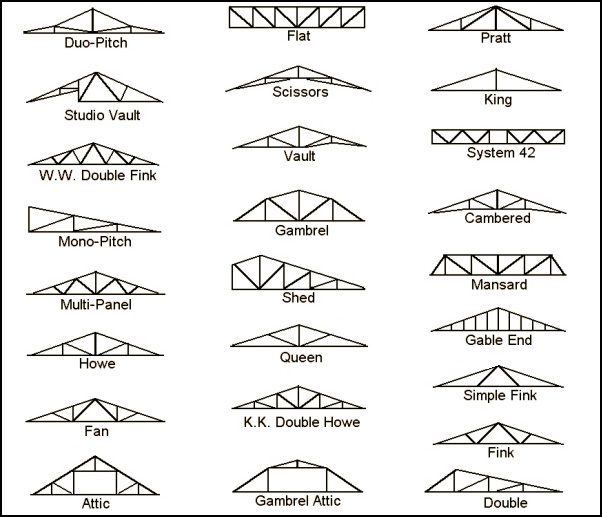 Pictured are some of the many different truss styles we are capable of manufacturing. From standard house trusses to 80' agricultural trusses we are able to offer a complete engineered wood truss system to meet your needs, whatever they might be.